This product came to me at just the right time. Board Exams are next weekend (to be followed by a week of final exams) and despite all my efforts to relax, the circles and little lines under my eyes are betraying the stress and fatigue I'm feeling. 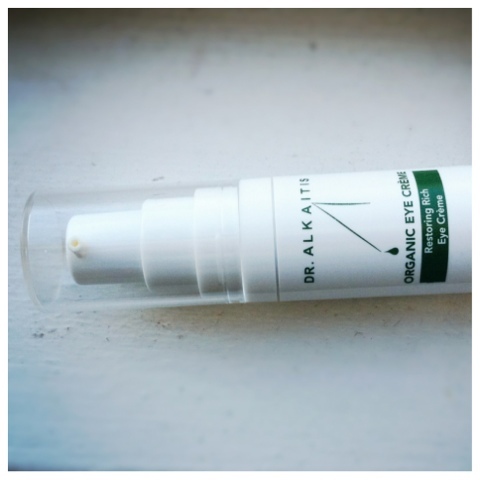 Enter Dr. Alkaitis Organic Eye Crème. I pat it gently under my eyes after I wash my face and apply toner (also by Dr. Alkaitis). I never imagined that after a few weeks of use I would legitimately be able to see that the skin under my eyes is softer and more hydrated, but it's true! I'm not making this up. What's more, the ingredient list is extremely clean and the scent is light and fresh. Love love love.